I remember when they repeated all the Minder episodes on Granada Plus and missed this one out. Luckily I had a copy on VHS that I'd recorded back in 1985. I posted on the forums at the time that anybody who wanted a copy could send me a blank tape and a return envelope. Well I was inundated with requests, kept me quite busy for a while. Trouble is I wore out my copy in the end! Thank goodness for the DVD release a few years later. I like this one, Terry gets a punch up though is outnumbered. Another little fact is that Michael Povey got married at the start of this series. His wife sadly passed away in 2007. Was Terry lying when he said he threw away Arthur's sentimental letter to him or do you think he read it? Sorry to hear that Meic Povey's wife died in 2007. As is bound to and without wanting to state the obvious, this clearly had a massive effect on him. At some point I'd love a Welsh speaker to translate his Welsh-only autobiography for me. In this one Chisholm & Jones are of course hot on the heels of Arthur and his phone stickers. I wonder what the equivalent of those stickers might be today? An Android phone that states "Approved - your privacy is secure". Hmmm, life seems so much simpler with a landline. Anyone know which supermarket Terry and Jan Francis are walking inside during this episode? I liked her better as this character than in Stay Lucky. Can't say for sure but I think it may have been in Acton - there is a supermarket used in "Days Of Fines & Closures" which is no longer there (on the High Street) so I would hazard a guess this could be the same place. I came across this today. Press information on actress Annee Blott - she plays one of the prostitutes (the one in blue) in this episode at the hotel where Arthur goes. 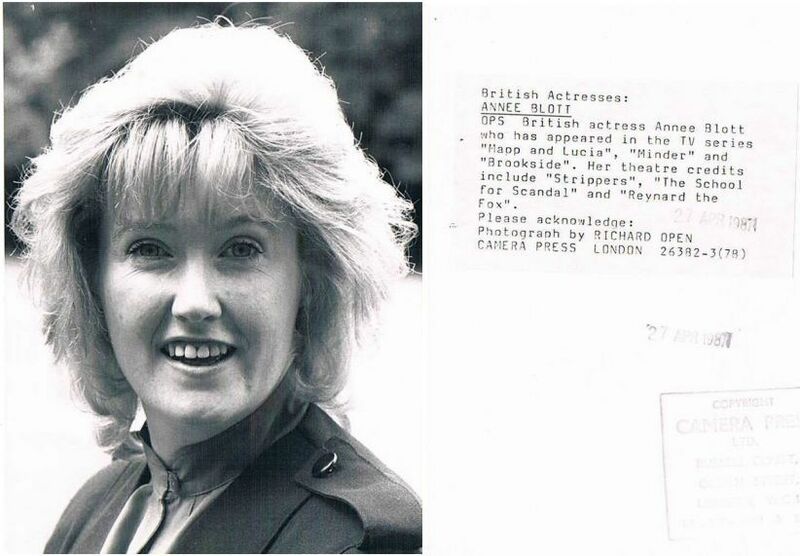 There is a very feint stamp on the right hand side: 21 APR 1987. I remember your posts on the forum back then, it was around the same time as a proposed MINDER london meet, if I recall rightly? Anyone know which supermarket Terry and Jan Francis are walking inside during this episode? As mentioned in the 'Locations' section on here - I can confirm it is the ASDA on the Park Royal estate. The place where Terry's bumps his leg is right near by too. I just watched this episode again. It is really good. A very young Peter Capaldi was absolutely fantastic as Ozzie. I wish Terry had married the burger queen and let Ozzie take over Chisholm knew what Arthur was up to but couldn't find the evidence (thanks to Ozzie). Chisholm's frustrated sneers were great. I liked the part where Arthur says Chisholm needs a "long weekend in Llandundno". I never realised "the moron" was the future doctor! so Two Doctors have appeared on MINDER! I noticed something very odd in this episode! Arthur goes back to Mctaggart and says he will take the phones, but won't pay the £200 a piece asking price, and instead offers £750 for the 5 telephones. Mctaggart starts to work out the cost on the calculator, and Arthur quickly says "£900". I can't see Arthur upping his offer by another £150, before mctaggart had time to complain, let alone work it out on the calculator! Mctaggart also says "make it a £1000 and i'll throw in the services of the engineer", i/e making arthur pay him the original asking price! Strange episode for me this... I can't watch it without thinking that the dreadful Paul Nicholas is going to pop out at any moment looking for his Pen... having said that, the scene in the hotel foyer when Arthur is looking for a brass is one of my top 5 laugh out loud Minder moments... "this is purely professional Andrew, purely professional"
I watched this episode yesterday morning and enjoyed it very much. I like the bit when the girl in the shop mentions Terry and was sure his friend was called Arthur and Chisholm was out of the shop as quick as a Scotsman chasing a dropped coin. To my American ears "The Moron" was difficult to understand at times and I kept wondering why he looked familiar. I was surprised that Ozzie was played by Peter Capaldi. Jan Francis is quite attractive and her meet cute with Terry in the supermarket was amusing. I loved Chisholm's reaction when the store clerk mentions the names Terry and Arthur! Not a bad episode but it did seem to drag a bit. The Moron was difficult for any non-Scottish person to understand, even certain areas of Scotland can't understand other parts, I was in a lounge at Charles de Haul airport in Paris a couple of years ago, talking to a bloke from Glasgow who I could hardly understand and mentioned I fancied going to Dundee, and he said "yer bl*ody canne understand a word they say up there mate". I did enjoy the way The Moron being difficult to understand was made part of the story. The way Arthur says, The Moron, like it's a proper name is amusing. I'm obsessed with the bit where Terry is on the boat with Jan and sings "liFe on the ocean wave". Not sure about his ski jacket here though! Enjoyable episode, but personally, I found Ozzie very annoying and hence dislikeable. Like Roddy (Windows) and Monica (Rembrandt). Very annoying/grating characters (to me). Love the scene where Arthur meets Granger in The Winch and at first didn't recognise him "It was the Mouse that put me off"
"It's not my fault your dad lost his Bovril". What does Terry mean? I've checked some rhyming slang sites but I'm none the wiser! 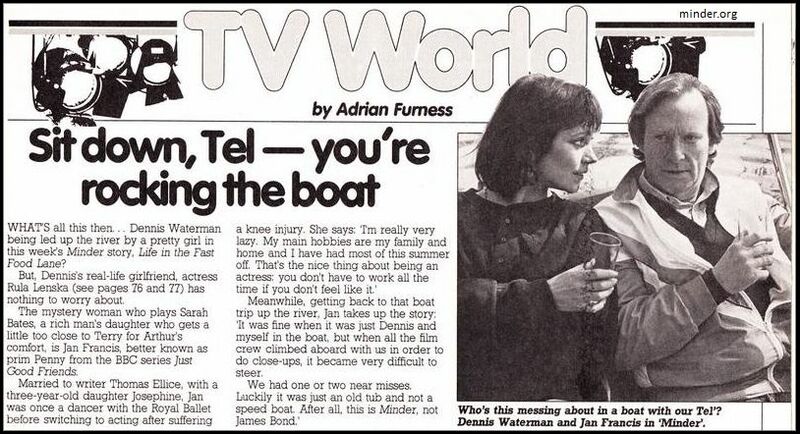 I have always liked this episode, great chemistry between Dennis and Jan Francis, I like the scenes where they were on the boat, sailing down the Canal. I can remember thinking once, when I watched this episode, how different Terry's flat looked. 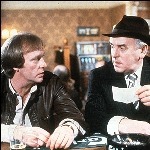 I can also remember that this was one of four Minder episodes, which featured a supermarket scene. Good to see Peter Capaldi (the current Dr Who) and David Daker, in this episode. 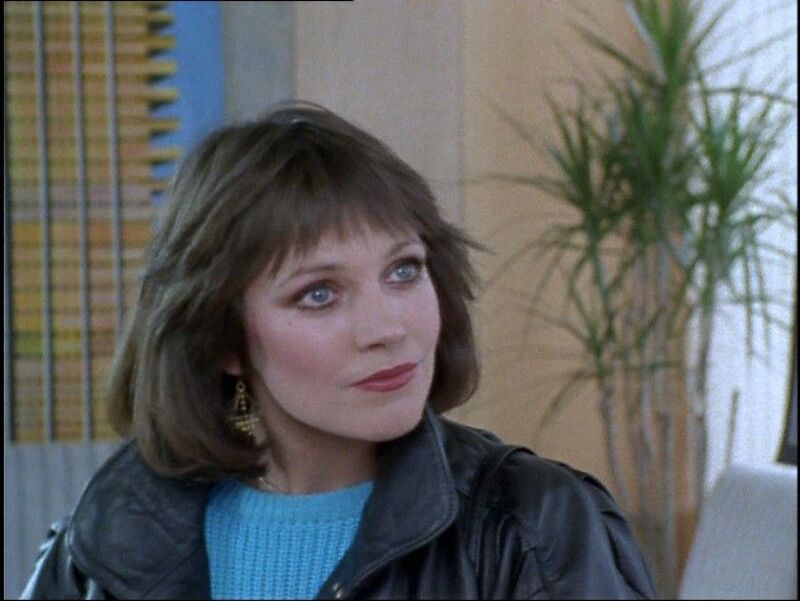 Below is a screencap (from Life in the Fast Food Lane) of Jan Francis as Sarah Bates. that would never catch on - little did he know ! He also proves , that even when car phones were in their infancy , using one while driving causes accidents , even if it does only involve a model aeroplane !! I have to agree , when Chisholm sprints out of the phone shop on hearing of Arthur s involvement , it is a laugh out loud moment ! I m sure "Spotters Syndrome" is something you would suffer from , if you spent a lot of time watching old tv shows & then writing about them !! Despite being a big fan of classic cars , these tin baths on wheels do nothing for me - give me on old Ford any day ! Poor Terry has no chance when faced with Peter Brayham and a few heavies. The stunning Debbie Arnold elevates this one to good. I think this award might go to James Marcus, who has a brief appearance as the villain Bertie in 'Caught In The Act, Fact' and would later appear as Phil (the ticket man) in 'The Long Ride Back To Scratchwood'. David Daker is also beaten by actor Ellis Dale, magistrate in 'Caught In The Act, Fact' and Mr. Howlett (church-goer) in 'Give Us This Day Arthur Daley's Bread'. Peter Capaldi also appeared alongside Dennis Waterman in the 1993 'Stay Lucky' episode called 'The Driving Instructor'. Yes, I should have remembered Marcus, also arguably Derek Martin, who was also in ...Scratchwood and his odd cameo in The Bounty Hunter. David Daker, Jan Francis - great cast and storyline. Another 1st class episode.